Can I tell you that I am a ribbon-aholic? I don’t know what it is, but when I see it, I just have to have more. Even worse when I’m working on a project I don’t always feel like I have just the right ribbon. Yup,…never fear, I’ll just get more. Then, just how to store it? Well, I have tried everything….rain gutters, tossing all in a big jar, ribbon rolls on cafe rods…and I found that my collection was just too unwieldy. After thinking about, I decided that it’s the round rolls that make up all the bulk so I took the plunge and decided to get rid of that bulk. To begin I purchased one of these three drawer units from Michaels for around $10.00, a package of small black hair rubber bands and purchased a sheet of mat board which I cut down into pieces measuring 2.5″ wide by 2″ high. I decided on the matboard because I found cardboard bobbins you can purchase at the craft store to be too small and too flimsy. I divided the drawers into four sections by putting in three 13″ pieces of matboard and anchoring them with tape. I rolled all my ribbon that were lengths of 5 yards and less onto the bobbins that I had cut. Now, just a warning, the rolling of the ribbon takes a little bit of time. I saved it by rolling when I was watching TV and even carried a small bag of ribbon and bobbins in the car to roll while I was waiting in the car or at the doctor office. Here are the drawers opened up to show how easy it is to pack and stack the ribbons inside the drawer. Here is what one of the individual bobbins looks like. It is simply a piece of matboard cut to 2.5″ x 2″ secured with a rubber band. I have three of these units all together. The top drawers are devoted to my American Crafts Ribbons. Those are not stored on bobbins. The rolls are smaller and since they come packaged in sets of six, I wanted to keep each mini palette together (shown below). 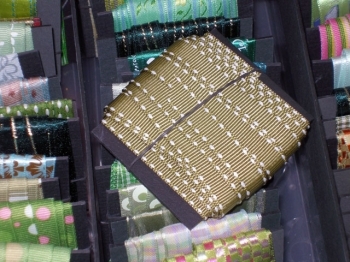 Even storing the American Crafts as full ribbons, I can get a whopping 88 rolls in one drawer! I think this system will keep me for a while, I have a little bit of room to grow in each drawer and I can stack another unit on top if needed. I also wanted to show a picture of the system that I’m leaving behind. Although it was portable, it was still too bulky for me. Each unit was capable of storing around 80 rolls of ribbon but when I got everything loaded I had 5 containers and over 400 rolls and it still felt a little bit too unwieldy. It would work for someone with a smaller ribbon collection. I hope this helps someone….it took me loads of time to brainstorm what I wanted to do and I’m really pleased with the results. Hubby is in Europe for the week. I’m going to Michael’s TONIGHT and sitting me arse in front of the Lifetime Movie Network and spooling away. I love your drawer ID’s too – so cute and original. Here was my solution from a year ago-a rep from Making Memories used my idea in their corporate flyer too. I’m curious- do the ribbons kink from being wound round the matte board or having the ponytail holder wrapped around them? I hate kinks in my ribbon so I am still on spools but in 3 weeks I’m moving 10 minutes away from the Offray outlet store… I don’t want to think about how much ribbon I’ll buy! You’ll be so proud of me….I made up my mind and sat down tonight and did exactly what you showed. I rewound all my 33 rolls of ribbon. Haha. It looks so much neater! thanks for sharing Becca. Any more way cool organizational tips I can copy? I love the ribbon storage idea and was wondering where you got the mat board? I am going to look for some but would like to know what kind of place to go to. I have an enourmous amount of ribbon and like this idea to store it all. 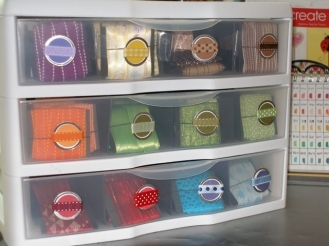 I love your ribbon storage idea. I’m thinking about adopting your method, but I do have a question. Do you find that the ribbon gets creased after it’s been wrapped around the card for some time? I’m not sure I would like having to iron it before I use it. A great idea but can I ask if the ribbon creases when wrapped around the mat board? OMG you are so organzied! I wish I was so organized. I may have to case this idea. How do you store your paper, your scraps? Love your idea. My corner is in a constant state of flux. If I spent as much time stamping as reorganizing….I have a 3 drawer, and went to Michaels to get mat board. I was talking to the girl at framing, about what I wanted to do (your wonderful idea) and she just gave me a piece of mat board! Of course, they do get alot of my dollars. Becca, you are a genius!! 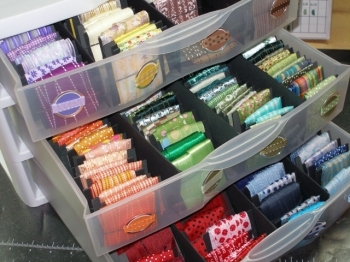 I have been searching & searching for the “just right” solution for my ribbon hoarding. I have gorgeous jars of colorful ribbon across storage cabinets, plus way too many rubbermaid containers of all sizes of spools, plus SU ribbon holders, and even ziplock bags of more ribbon. ACCCKKKKKK! You are an angel & genius altogether! OMG…this is freaky because I have almost a similar system I’ve been using for a long time now! Only yours looks gorgeous! Great Job! Where I live, its almost impossible to get plastic see-thru drawers so I just have some small, inexpensive plastic boxes in which I store them. Each colour has its own box! Easy and portable! Love how you stored yours! Heart! Would love to know where you got your drawer set from (pun unintentional !) and what dimensions does it have? Love the ribbon idea. Can I get some exact measurements of the 3 drawer container. Thank you thank you thank you thank you thank you thank you thank you!! I stumbled across your site and ribbon idea few months ago and thought this was PERFECT for me!! I was so excited. I started cutting and winding ribbon right away. I had SOOOO very much of it also. This is the greatest system for ribbon I have came across so far and thank you so much for sharing it with us. I took an online organization class and was referred to your website for your ribbon storage system. I was only mildly interested in reorganizing some of my scraproom areas, but when I saw your ribbon storage I fell in love with it. It took me about 3 weeks to cut, wrap and label my ribbons – I too needed 3 of the 3 drawer storage units to hold all my ribbon. Once I was done it looked so great that I realized I needed to reorganize the rest of my craftroom before I put my ribbon back in my room. 4 months later and I’m almost done! Thank you for sharing your wonderful ideas. I only wish I could come up with 1/2 as many fabulous ideas. Sounds like a great system! My ribbon is going to drive me crazy if I don’t get it under control shortly. The only concern that has kept me from doing this is the potential creasing the bands might/would cause. Why did you pick hair bands over pins? I saw this when you first posted it back in 2008 and I am wondering if you still like this storage method? I desperately need to come up with a new way to store my ribbons (previously have had them hanging on rings, but I now have 2 little boys who like to get into them!!). Also, do you find the ribbon creases and what do you do about it?